A background as unique as the techniques and approaches he teaches, Dr. Teplitz originally graduated from Hunter College and Northwestern University School of Law and practiced as an attorney for the Illinois Environmental Protection Agency. He then studied and received Masters and Doctorate Degrees in Wholistic Health Sciences, and over the last 32 years, has gained wide-spread acknowledgement for his expertise in helping others achieve their ultimate best in all areas of life. As the creator of the Instant Pain Relief techniques, he has successfully taught techniques to over 100,000 persons, using and teaching his methods to stop patients' suffering for over 30 years, with amazing, powerful results. Dr. Teplitz has been a field manager for the Inscape Publishing Company (previously Carlson Learning Company) since 1977, and President of his own consulting firm since 1974. Jerry conducts seminars in many areas of expertise, including employee productivity, sales development, and stress management along with his Network Management, Selling, and Marketing Switched-On Series™. His List of Clients include such organizations as: GlaxoSmithKline Pharmaceuticals, American College of OBGYM, Assn of Professors of Gynecology and Obstetrics, Bellins Memorial Hospital, Canadian Pharmaceutical Association, Eastern Virginia Medical School Greater New York Dental Society, Merck Pharmaceuticals, National Association of Chain Drugstores, National Wholesale Druggists Association, Professional Assn of Health Care Office Managers, Special Procedure Radiologists Conference, Virginia Health Care Association, plus over 400 colleges and universities across the United States and Canada. As a professional speaker, he has spoken to over one million people. Dr. Teplitz has also been honored by his peers in the National Speakers Association by receiving the designation of "Certified Speaking Professional" (CSP) which is awarded to less than 9% of it's 4,000 members. He has also been selected as "Top Rated Speaker" by the International Platform Association. Successful author, speaker and trainer, Jerry's books include Managing Your Stress: How To Relax and Enjoy, Switched-On Living and Brain Gym for Business. Published works and articles about, or authored by, Jerry have appeared in such publications as Successful Meetings, Plane and Pilot, Golf Illustrated, T&L Golf Magazine, as well as a review of his natural migraine pain relief programs in Prevention Magazine. 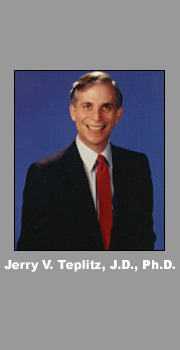 Dr. Teplitz is listed in several editions of Who's Who in America, and served for eight years on the faculty of the U.S. Chamber of Commerce Institute for Organization Management.